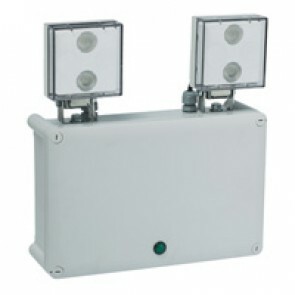 High performance LED non maintained emergency lighting luminaires. Certified to IEC and EN 60598-2-22 standards. High power LEDs spotlights with optimized lighting distribution. Low consumption electronic switching power supply. 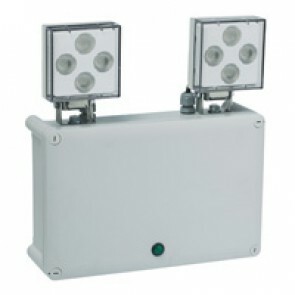 High capacity terminals: 2 x 2.5 mm² - IP 55 - IK 07. Duration: 1, 2 and 3 hours. Ni-Cd batteries. Recharge time: 24h. Green charge indicator with high luminosity LED, to improve visibility from the floor when high installation. Power supply: 230 V~ ± 10% - 50/60 Hz. Class II. Rest mode with remote control device Cat.No 0 039 01 to avoid battery discharge in case of voluntary power cut. Surface mounting installation with 4 wall-mounting lugs (Cat.No 0 358 02, supplied) or 4 screws (not supplied).